Legendary™ Encounters: An ALIEN Deck Building Game is a Co-Operative game set in the ALIEN universe. Players will take on the roles of a Commander, Gunner, Synthetic or any of the ten role cards while recruiting powerful allies such as Ripley, Corporal Dwayne Hicks or Christie the Mercenary. Legendary™ Encounters will take players on a terrifying journey through all four Feature Films, “ALIEN, ALIENS, ALIEN 3 and ALIEN Resurrection” as they work together to complete challenging mission objectives. Scan Rooms, Attack Xenomorphs, avoid Facehuggers and try, TRY to avoid the ultimate death...becoming the victim of a ravenous Chestburster. If a players fate is destined to this horrific demise, than that player will take on the role of a Xenomorph and try to stop the other players from completing their mission objectives. Legendary Encounters: An Alien deck building game is a follow up to the same game set in the Marvel universe. In LE:A you have the chance to play through all 4 Alien movies. The difference here is that this is full coop. Although there are rules for an alien player I suspect most will play it this way. Let me start with the biggest issue of the game. Setup (and cleanup). As mentioned above you can play through all 4 movies or you can mix and match as you may want. However, each movie has 3 different Alien decks as well as 4 different character decks which needs to be prepared. Keeping it to one movie at a time will at least help you save some time. Thankfully the mat you get in the box is great and makes it very easy to keep decks separated. The Alien deck is prepared by selecting three objectives named 1, 2 and 3 containing 9, 11 and 13 cards. In addition a number of drone cards equal to the number of players are shuffled into each. The objective 3 deck is placed on the bottom, objective 2 above that and finally objective 1 so you’ll have an alien deck made up of 33 + (#players * 3) cards. The hero deck is simply 4 of the 16 character decks shuffled together and then the top 5 are added to the HQ field on the player mat ready for hiring. Each player then receives a deck of 7 specialists and 5 grunts plus their character role card which is shuffled to form a startdeck while an avatar card is placed in front of you to keep track of your life points. A strike deck is shuffled and placed on a designated spot. You’ll draw from this deck whenever you’re attacked (not if, when!). Also there are spots for location and the active objective. Now you’re ready to start. On your turn you’ll start by drawing a facedown card from the alien deck adding it to the rightmost spot of the complex, pushing cards one spot to the left if there are any. If the complex is full the card in the leftmost area is flipped up and added to the combat zone if an enemy, or resolved if it is an event or hazard. After resolving the alien card you may play cards from your hand for actions, recruiting points and/or combat points. Recruitment points are used to hire cards from HQ to your deck and combat is of course used to battle aliens. However, you may not fight an enemy while facedown. Each location has a sombat value needed to scan the card (between 2 and 4) which needs to be done before you can fight it. Scanning an area allows you to flip up the card. Any events or hazards are resolved immediately as well as reveal effects on aliens. After you’re done and if there are still aliens in the combat zone they attack you and you’ll draw 1 strike card for each alien attacking you with each strike card ranging from 1 to 5 hit points. If the total amount of hit points taken reaches the the number on your avatar you will be killed and eliminated from the game. Finally if you’re still alive you discard all cards, both used and unused, and draw 6 new ones. Two keywords that need an extra mention are these two. Coordinate is probably the most important feature of the game. A character with coordinate allows you to play the card on another player’s turn and letting them use it. In addition you will draw a replacement card for this. Using coordinate is often the difference between winning and losing as it allows you to defeat the most difficult monsters and recruit the most expensive cards. Vigilant isn’t half bad either as cards played with vigilant can be kept on the table from turn to turn until the ability is used. This also gives you the opportunity to save up for a big recruit / fight. – Do I dare scan a room? – What is the event? – What is the hazard? – Worst of all, could it be a facehugger? – Can you help if it is a hugger? It all comes together to form a great adventure and puts you directly in the claustrophobic setting of the movies. Ever since Upper Deck announced their plans to release an Alien themed version of Legendary I’ve been staying frosty in anticipation. This has been a tricky license for designers to get right (Don’t even mention the video games) So would Upper Deck deliver? I’ve played and enjoyed Marvel legendary but for me it suffered from some disjointed theme issues with the heroes and crippling downtime when played with four or more, and lets not get started on the set up and tear down time on that one. So it was with some hesitation that I approached this new edition. Designers Ben Cichoski and Danny Mandel have managed to work wonders by tweaking the elements of what works within the existing Legendary system and adding enough spins of their own to embrace the Alien theme and have taken this series in an exciting new direction (sort of like Prometheus only much better). First off they’ve made this a pure co-op it really was the only way to be sure, its us against the bugs and it manages to successfully mesh the deck building mechanisms with theme to pull off something a bit special. Each of the four movies are included in the box, composed of three separate decks which are combined to create that mission, played alongside these are location cards and objectives whose triggered events include many nod’s to classic moments from the films with goals based around major plot points, all these work together to give a greatest hits of the Alien’s movies. Replacing the four color heroes of Marvel are a gristle’d bunch of survivors from each of the films with abilities tailored to fit thematically with those scenarios and caps doffed to some clever choices here with some interesting powers that managed to reflect those characters little quirks or moments from the films. All of this nerdery helps to dunk you into the theme like a rich tea in a hot cuppa and really ties the game together with each scenario capturing its celluloid counterpart, there are moments when you really do feel like you’re on an express elevator to ****. Besides all of this card based joy we also get a play mat instead of a board, which I have to say is a brilliant feature, it looks stunning on the table and makes manipulating the cards a lot easier than trying to wrestle them up off a board, I hope that we see more of these coming along in the future. As I progressed through the films the game seemed to get increasingly harder to beat, with some of the big bad’s causing Hudson levels of histrionics when they appeared in all their brown stain inducing glory. What’s so great is how the designers have managed to layer in so many neat little thematic elements from the films to help put you into the heart of the action, from the macho posturing and gun laden fun of Aliens to Alien 3 where the game I played felt suitably desperate, with you constantly struggling with resources and a savage creature that echoed the dire situation the characters found themselves in that movie. I really like what they have accomplished here and it feels much more thematic and challenging than Marvel Legendary did. Another nice new touch is that each player now gets an avatar which also works as health meter, each of these classes receives one specific card that goes into their deck allowing everyone a little something different and special to bring to the fight. And as your character has such a limited health score it really builds on that sense of dread and threat that the game thrives on and also helps to make you feel part of the action rather than just playing a set of cards each round. Another change to the basic mechanisms is how the cards spawn from the hatchery, to further enhance the feeling of encroaching menace they now move across the complex face down representing the doom-laden bleeps of a motion sensor as they edge closer to your hiding spot. The only way of flipping these is to use your attack and depending on where they are in the complex will alter how much it costs to flip them, often resulting in exhausting all your attack in the early game to uncover something unpleasant. Its not all horror and death, hidden among these cards are those objectives that you need to complete to progress through each scenario and also some neat little Easter Eggs from the movies. There’s a really ticking clock to this part of the game because you don’t want to dally as those cards keep coming and if objective two problems and monsters are spawning and you’ve still not resolved the first its likely you’ll have a rotten afternoon. Boy is this game hard! And the more players you add to the mix the harder it seems to get, there are a few new kinks that have been included on the cards that do help. There is the new co-ordinate skill which allows you to play a card from your hand on another players turn allowing you to add that cards resources and perks to the current players total, really handy for dealing with some of the nastier surprises or if you get a bad draw. To stand any chance at successfully winning the game you’ll going to need to embrace this new ability and for a simple little addition it really adds a cool cooperative element to play. There’s so many neat little thematic design choices buried in the game, one of my favorites is the facehugger’s. These can hatch from eggs which add some peril to proceedings and will often force you to use those precious attacks on wiping them out, but if one of these skittery little swines hatches it latches onto the active player and they have their turn and till the end of the next players to kill it, if that doesn’t happen then everyone has a problem because a chestburster card is added to that players discard deck, and when eventuality dealt will kill that player. There is nothing worse than knowing that one of these cards is hiding in your deck and the palpable sense of dread as everyone watches breath held each new deal you make. There are a few slim opportunity’s to avoid this situation but generally once you’ve been fertilized then its just matter of time until you’ll be ruining somebodies breakfast table with all the gurgling, thrashing and spurting of your runny bits. There are a bunch of optional add on’s that help to spice up proceedings, there’s the Alien deck which essentially means that after you’ve gone through the agonized labor pains of birthing your new xenomorph then you can pick up this deck and play as an bad guy, great fun but it will usually result in the pretty swift death of everyone else at the table. And then there’s the option of secret agenda’s that adds a traitor mechanic to the game and some cool cards to peoples decks and really sells that evil corporation idea from the movies. Both of these are great additions, but I strongly urge you waiting until you have a few plays under your belt, especially the Alien deck as that’s evil. So summing up time, well lets quickly address a few issues that this series has suffered from. First is the initial sorting of the cards, yep its involved and you should easily put aside at least an hour to do this. A comprehensive list of the cards to check off in the manual would have helped with this, the ones on BGG are great and without them the task would have been a nightmare the manual really doesn’t explain the process as well as it could and like legendary the text to identify the different sets is minute. If your a fan of the films then you’ll going to lap this one up, its a tough little son of a game and is certainly a challenge. All the new tweaks made greatly improve upon the foundations built by Marvel legendary, the co-op along with the different modes of play give this some decent longevity and have reduced that terrible downtime I encountered playing its predecessor. Whilst this is not doing anything new or revolutionary its a solid mesh of theme and mechanics working in harmony to produce a tense white-knuckle roller-coaster ride from beginning to end, which considering its subject matter makes this just about perfect. Legendary: Encounters takes the Legendary Deck-Building system, themes it in the ultra-gritty science fiction universe of Alien, and the proceeds to punish you for deciding to play it. In Legendary: Encounters, you and a team of fellow characters work your way through a set of 3 objectives that follow the same storyline as the movies. You are given a starting deck, plus a card unique to your character (like a Battlefield Medic card or Gunner card) and then with those cards, you purchase more characters from the barracks, or scan and kill anything moving its way through the complex. It appears extremely complicated on the surface but as you start playing, the game falls neatly into place. Add a card to the complex; play your hand; buy what you want; kill what you; move on. What makes this game truly unique to me is the story aspect. Usually, if you’ve played one Deck-Building game, you’ve played them all. Gain; Draw; Play; Shuffle; Repeat; but with the game following a narrative and the enemies growing in power as you progress, plus the random enemies from the Drone Deck that are added in, Legendary: Encounters not only differentiates it from all deck-builders, it differentiates itself from every other play through. Add in the co-operative element, and you’ve got a game that removes competitive tension between the players and replaces it with a shared experience of fear, creating a universal bond with the players for the entire play time… until someone dies and decides to play as the alien. Then all bets are off. This game is fun but I wouldn’t recommend it to the novice gamer. If you love the Alien franchise, this is a must have. 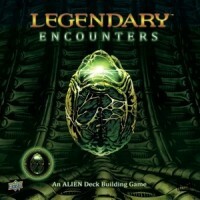 Legendary Encounters: An Alien Deck Building Game is a new title from Upper Deck. It plays up to five players in a fully cooperative game experience and includes scenarios for each of the four Alien movies. The base game comes with a handy player mat that includes spaces for all the game play cards. The game includes a location and objectives based on the particular movie that you have selected to play. The ability to play all four Alien movies is a lot of fun. It’s all here. The way the Hive decks are stacked to go along with the movies provides you with a close association with the movie narrative. You definitely work together to survive the Alien onslaught. You can coordinate attacks and resources between players – you have to help each other to win. The play mat is laid out well, has a non-skip backing, and rolls up nicely for storage in the game box. Having this is great to keep the many different category of cards in their proper stacks. Blank cards. This initially confused us as we thought we had misprints or missing cards. It ended with us counting and sorting all the cards a couple of times to make sure we had the complete decks. Not the way you want to start out playing a game. The game also has differing art styles for each scenario. This might be a little bit of annoyance, but doesn’t take away from the gameplay. And finally, the text on each card is also really small and at times very hard to read. This makes building the Hive decks and Barrack decks very interesting for people without perfect vision. This game is dripping with theme acid. The suspense that the hive deck provides moving through the complex has to be experienced. And, start popping the corn and melting the butter, because once you complete the game, you’ll want to dig out your copy of the movie “Alien” and settle in for the night. Add a Review for "Legendary Encounters: An ALIEN Deckbuilding Game"